Oh, for those that are not familiar with all the posts from this site, these were taken on our second day at the Henderson Bird Viewing Preserve in Nevada. Definitely better light for that second day. 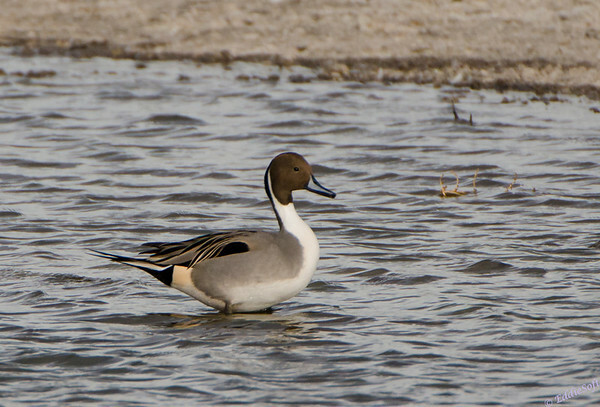 Up to this point all I’ve been able to show you is the male Pintail. No fear, we were lucky enough to get the female while we were there. Definitely not as impressive as the male and not entirely sure I would be able to easily identify the female if it wasn’t for the proximity of the male. My guiding principle of widening some of the shots in the field to help in identification proves fruitful once again. Of course, that doesn’t always result in proper identification. Take for example the following wider shot. 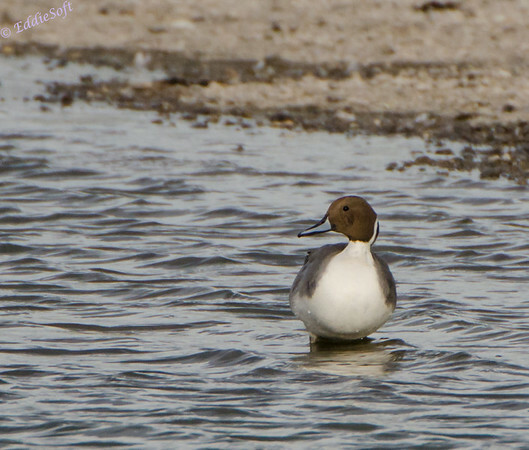 You just might think you have a shot of two male Pintails out enjoying a leisurely paddle with their significant others. This is not the case unless these males have decided to branch out. 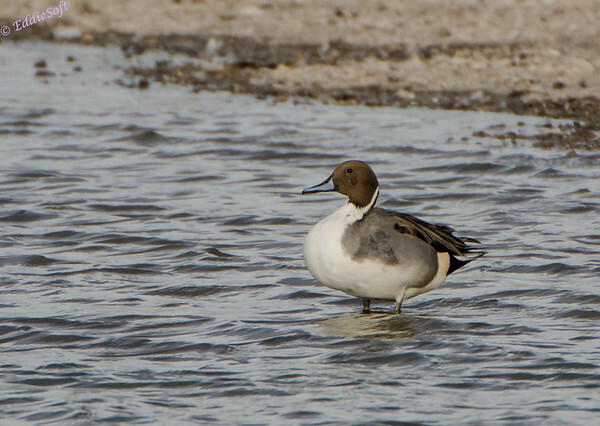 Using the comparison of the female in the previous shot you’ll notice those are not female Pintails. Nope, them be Ruddy Ducks (link here). What really happened is the two males intruded into the leisurely paddle of a Ruddy couple. The male Ruddy being on the far left and the female on the far right. If you happened to hit the Ruddy Duck link I probably need to apologize. I ID’d the ducks on that post to females which look like the male version here and not the female – turns out the males do not sport a teal bill in their Winter plumage which was throwing me off – also think there was a bad reference on the net – always learning, always learning. Glad I finally tracked this set down so I could show you some better product. 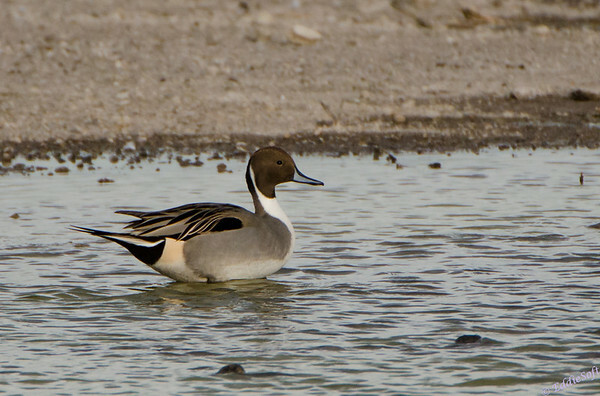 Nice pictures from all angles of the Pintail. These are indeed better pictures. They look smooth and velvety. Were these from the second OVERALL day?? How many birds were there at Henderson, anyway?? I keep dropping hints, but you might consider taking a stereo pair sometime and posting it here as a side-by-side for parallel viewing or as an anaglyph for all of us with red/blue or red/green anaglyph glasses (I just bought 24 of them–long story). Of course, you have to have a bird that stays still like a statue while you shift slightly to the side and take a second shot. Mind you, when I was in Florida taking pictures of that crane that landed 10 feet in front of us and froze like a statue for several minutes, it never once occurred to me to shift slightly and take another shot for a stereo pair. Doh! But if you happen to run across two pictures of a statue-still bird that were taken at a horizontal offset of roughly the distance between your eyes, let me know and I’ll fine-align the photos vertically and create a stereo pair for you in both formats (and send you and Linda red/blue cardboard glasses). Those were indeed from only the second day we’ve been there. Not sure it was so much the quantity of the birds (although there were a LOT), but rather the amount of NEW birds to my list. Everywhere I looked, in the trees, on the land and in the water there was something new for me to photograph – quite the treat and one hidden gem of a place to go birding – probably better in that we weren’t from the area so that provided a better opportunity to see the regional varieties. I know you keep dropping hints (although I think they have now gone beyond a simple hint). Every time you mention that I think back to that PERFECT opportunity you had to make your own stereo pair with that Egret/Heron that decided to check us out that day. If I think about it I’ll try to get a set – apparently you are forgetting these damn birds don’t tend to just sit there motionless – that one we say was a rarity although if it is going to work it will be that type since they are pretty still while hunting the waters.